Son of the Mob is a great book. It is about a high school kid named Vince. Vince's dad is the boss of a mob. Vince wants nothing to do with it. One day he meets a girl named Kendra who is the daughter of an FBI agent. Of course they end up falling in love! The reason I think this is a great book is because of how Vince keeps his dad a secret from Kendra. He does everything he can to keep it a secret. For example, he does not want the parents to have dinner together. Of course eventually she finds out that he is the son of a mob boss. The School for the Insanely Gifted is a good book. This book contains ridiculous inventions and crazy schemes that somehow work out. The founder of the school of gifted kids is a fraud and a group of kids including Harkin, Cynthia, and Daphna set out to find out why. Daphna's mom had recently died in a plane crash, and unfortunately was never found. I liked this book because of the inventions such as the top hat that has a computer where you can search the Web in your mind. Over all this book was pretty enjoyable. Buffy the Vampire Slayer was an awesome story on television. In book form, it is absolutely banal. The whole book seems as if they took the script straight from the TV show and turned it into a book. Buffy Summers is the "Chosen One". The Chosen One is a person who protects the world from evil by slaying the monsters that have managed to get into the human world. This book is a collection of three stories in which Buffy and her two friends, Willow and Xander, fight monsters and solve the mysteries of the underworld. If you like the way the story sounds, I suggest watching the TV show rather than reading the book. In this case the show is better than the book! Artemis Fowl by Eoin Colfer is a mystery and fantasy book. The story starts out with the main character, Artemis Fowl, a child prodigy who stumps even the smartest of doctors. But there's a catch; Artemis Fowl believes in faeries. He is from a very rich family so he uses all of the resources he can to search for these faeries. At last he ends up in Ho Chi Minh City following a lead which said that there was a magical faerie healer there. Once he gets there he finds that the rumor was true! What will he do now? Artemis Fowl has a somewhat weak storyline with strong characters. Almost the whole entire book rides on the characters. Overall it was an okay book. Brainboy and the Deathmaster by Tor Seidler is a sci-fi book. The story is about an orphan named Darryl Kirby. Darryl Kirby is extremely skillful when it comes to videogames. When a new version of his favorite game, Starmaster, comes out he begins to play it. But he notices that something is different. It's almost as if the game had a mind of its own...Brainboy and the Deathmaster is an average book when it comes to plot and storyline. Yet the book still manages to keep you hooked. Overall the book was an enjoyable and fun read. The book The Watsons go to Birmingham is based on a true story. In this book Kenneth Watson and his family go to Birmingham to meet their Grandma Sands. They are having so much fun with their Grandma until one day a terrible accident happens. You�ll have to read the book to find out. While at their Grandma's house Kenneth and his brother finally learn to get along. This is a great book for people who want to learn about a tragic event in the USA. Librarians Note: The 16th Street Baptist Church in Birmingham, Alabama was bombed almost exactly 50 years ago, on September 15, 1963. It was not an accident. The bombers were members of the United Klans of America. 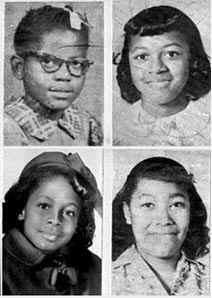 Four little girls, Addie Mae Collins, Cynthia Wesley, Carole Robertson and Denise McNair, died. In the book Forge a slave runs away from her owner and is on the run. On the way she meets a black soldier. They run away and join the army during the Revolutionary War. During the war, Curzon wonders if it is even worth fighting for the Americans because they are mistreating them. They have to survive a cold and harsh winter at Valley Forge, building their own house. All they have to eat were Firecakes. " Breakfast was Firecake and water. Dinner was Firecake and water.". I recommend this book to anyone who is interested in the Revolutionary War. This is a very interesting book about a child lawyer. He is not really a lawyer but helps a lot of people win cases. He even found his own dog in animal court. In this book Theo has to stop the government from tearing down over 50 private properties to build a big interstate. This interstate will pass right next to a school and will tear down new soccer fields that just cost 1 million dollars to build. His friends' property will also be torn down. Theo, his friend, and his dog get jumped by contractors. Theo is now determined to win this case. Read this book if you like mystery and law. Chinese Cinderella is a memoir about a girl named Adeline Yen Mah. After her mother dies while giving birth to Adeline her whole family stays away from her because they believe that she is bad luck. And then her father marries a woman who treats her even worse than her family already does. This story is about how Adeline fights through her stepmother's cruelty and tries to live in this cruel world. This book is a mix of English and Chinese, but if you can't read Chinese there are translations in the prologue and in the back. I thought that this book was amazing. The author makes you understand what is happening and the story flows smoothly. I would recommend this book for anybody who likes to read non-fiction books with a lot of drama in them. The Book of Everything by Guus Kuijer is about Thomas and his difficult life. Thomas had an unhappy childhood. His father was abusive to him and his mother. Thomas can't protect himself and his mom from his dad's attacks. The book is written from the point of view of the adult Thomas looking back at his life. There's a lot that happens to him that involves magic, religion and even a plague of frogs. Although the book is somewhat confusing, it also interesting, especially as you can understand how Thomas feels when his dad hits him. As a reader, I was bothered by the way that Thomas' dad beats him and his mother instead of expressing his anger in words. But I have mixed feeling about the book because it also was interesting to read. So I wouldn't recommend it for every reader. The Water Castle is not a very good book. It is about a kid whose dad has a stroke. When he moves to the supposed location of the hidden Fountain of Youth he searches for it to cure his dad. It switches back and forth between the past and the present which is very confusing at times. I personally thought the book was okay, but going back and forth made it as if you were reading two books mixed together. If you can solve complicated puzzles you might like this book. Bitter Melon is a book about a girl named Frances who is Asian-American and lives with her mother while she goes to high school. Her mother is very strict with her and wants her to become a doctor. Frances signs up for AP calculus but accidentally gets placed in a speech class. But after the first class she thinks that she might try it out for a few days, but a few days turn into a few months, and by then it is too late. What will she do? Bitter Melon is a wonderful yet sad and dramatic story. The book has a melancholy feel to it throughout the story, so if you like sad dramatic books, I would recommend this one for you. If you read the book, When You Reach Me, you will be confused but everything will make sense in the end. A lot of odd things that happen. You will learn about time travel, a girl with no friends, a crazy man who is always practicing his kicks and sleeps under the mailbox. The book says, "Why do you think he sleeps like that, with his head under the mailbox?". I recommend this book to anyone who likes to think because this book will challenge you! Celebrate Banned Books Week with our Library! Come check out a book in the most challenged series for kids, Captain Underpants, or read a challenged picture book like In the Night Kitchen by Maurice Sendak. Or you could enjoy one of the numerous -- and frequently challenged --Alice books for tweens and teens by Newbery Medalist Phyllis Reynolds Naylor. While Banned Books Week ends on Saturday, Sept. 28, you can continue to celebrate your freedom to read all year long! And mark your calendars now for Tuesday, Oct. 15 at 7:30 in the Takoma Park Community Center Auditorium, when Alice author Naylor will discuss the completion of her best-selling series. Now I'll Tell You Everything, the final book in the long-running series, will be published the same day, and Naylor will talk about her years writing the books, which have been hugely popular with tweens and teens, and also among the most challenged in the nation. After speaking, Naylor will take questions from the audience and finish by signing books. Copies of Naylor's books will be available for purchase by Politics & Prose Bookstore, but no purchase is necessary to attend this free event, at which Naylor will launch a nationwide tour devoted to the final Alice book. Registration is encouraged; this event is great for kids ages 10 up, their parents, and long-time Alice fans who are now in college or well-launched into life! Register online Program Registration - Takoma Park Maryland Library or call us at 301-891-7259. Ever wonder what the future will be like? The book Divergent by Veronica Roth will give you one opinion. Divergent takes place in Chicago, after the "apocalypse", and when you turn sixteen; you have to make a choice between five factions that will determine your future. The factions are Amity-the Peaceful, Dauntless-the Brave, Abnegation-the Selfless, Candor-the Honest, and Erudite-the Intelligent. Each faction has its own secrets, alliances, opinions, and ways of running the faction. The choice is tough, especially for the main character, Beatrice Prior. For most, there is an "aptitude test," which tells you which faction would be the right fit for you. But Beatrice's test is a little bit different, which makes her choice a little tougher. Her test holds a secret, which means life or death for her, and yet she cannot tell anyone her test results. In my opinion, her test sets the tone for the story. Scary, but surprising, and suspenseful, which is why I loved the story. The setting was obviously unique, and the characters were ultra-realistic. I felt as if I was going through the faction-choosing journey, the faction initiation, and the first stages of living in the faction right along with Beatrice. Overall, I think both genders will like the story, but this book is geared toward the teen audience because of mature content, romance, and scary scenes. After really enjoying this book, finding out there is a movie coming out based on it next year, makes me really want to see the movie. I also want to read the rest of the books in the series to learn more about Roth's opinion about our future society. If I was put through the "Choosing Ceremony," I would choose Amity, because I like the way their faction runs and the values they believe in. Which faction would you choose? Do you like mythology? Do you like fiction? If you answered yes to either of those questions, you will probably like this book. The Lost Hero is a book that is fiction and mythology mashed together. The main characters are Leo, Jason, and Piper who are half-bloods; half-bloods are people who have one mortal parent and one immortal parent, a Greek or a Roman god. Leo is a son of Hephaestus (god of fire), Jason is a son of Zeus (god of the sky), and Piper is a daughter of Aphrodite (goddess of love). The trio use their special powers they inherited from their immortal parents to fight the evil earth giant, Enceladus, who is about 30 feet tall. He is holding hostage Piper's famous father, Tristan McClean, and Hera, the queen of gods. Gaia, who made Enceladus, is sucking up Hera's power day by day, and Leo, Jason and Piper have less than a month to locate the giant. That sounds so tiring! I enjoyed the book very much because it's one of those books that you can't put it down and want to read it all night. The Lost Hero is definitely for kids ages 11 and up and I�m really sure boys and girls will like it very much. In my opinion it is the best series ever. you just have to read this book, you must! The Invention of Hugo Cabret is like a delicious trail mix that I could not get enough of. The reason I say this is because the book, written and illustrated by Brian Selznick, has so many different elements in it --movies, pictures, history, suspense, mystery, foreshadowing, friendship, and a lot of surprises -- similar to the variety of ingredients in trail mix. Once you reach into the bag or begin this book, you never know what elements of the mix will be in your hand. I could not stop reading this book, set in a train station in Paris and focused on a boy named Hugo, and his quest to finish an automaton -his father's favorite pastime before he passed away. I was so intrigued by the characters, who were easy to relate to, as well as the setting, which was so different from my normal life. Throughout the story, I loved that I was able to use my imagination with the incredibly-detailed pictures, as the words guided me through the story. As you can see, this is a crowd-pleaser for all ages and genders. The book won the 2008 Caldecott Medal and already has been turned into a movie. I hope Brian Selznick will think about making this book the first in a series!